Property Tax Bill Day - Are You Getting Your Money's Worth in Elk Grove? Call it a case of anticipated sticker shock - the day many Sacramento homeowners receive their annual property tax invoice. For me, today was that day. Today is one of those days that you know is coming - like April 15 for income tax procrastinators - and even though you know what is coming, it still hits you like a blast of cold water. Whenever I get my property tax bill, I always ask myself if I am getting my money's worth. This year is no exception. In reviewing my bill, in addition to my regular county taxes, there are other assessments. There are two lighting and landscaping assessments from the Cosumnes Community Services District for the entire district and my immediate neighborhood, and three Mello Roos assessments - one for the Elk Grove Unified School District and two the City of Elk Grove. Let me say right now, I am not some sort of tax anarchist in the mode of Grover Norquist and I usually support public funding of vital infrastructure programs. Like most people, I understand if you want quality schools, safe neighborhood, sufficient civic services and properly maintained infrastructure, taxes are vital. Having said that, I have to ask with the $874.84 I am paying for a "Maintenance Services CFD 2006-1- $450.48" and "City of Elk Grove CFS 2006-1 $450.48" am I getting my money's worth? A few years ago I was satisfied that I was getting money's worth. Today, I am not so sure. Let's first consider road maintenance. In the words of Elk Grove's Public Works Director Richard Shepard, the city is currently deferring $8 million in annual road maintenance. As Shepard has made clear on numerous occasions, the longer road maintenance is deferred, the higher costs it will be to taxpayers. Like any deferred costs, these will grow at a geometric rate and thus exposing taxpayers to not only crummy roads but higher tax costs. And then there is the matter of staffing. Having come out of the recession, Elk Grove City Manager Laura Gill and the City Council seem to be on a hiring binge, and we are not talking about people who provide actual services to Elk Grove residents either. Gill has hired a stealthy Economic Development Director and Assistant City Manager that together are costing taxpayers over $325,000 in salaries and benefits. What are they bringing to taxpayers and could their jobs not have been accomplished with existing staff? That is one question I cannot recall the city council asking the city manager. Meanwhile, Elk Grove Mayor Gary Davis has deemed it necessary for taxpayers to hire him a full-time assistant. Last time I checked, the mayor and city council positions are part-time. Memo to the Mayor - if you cannot do the duties you swore an oath to undertake with a part-time assistant, either vacate your office or dump the coffee business. Taxpayers shouldn't be on the hook for your extra curricular activities. We don't want to hear you or any of your council colleagues whine about all the duties you have, the tough decisions you have to make or how many hours you spend attending to city business. You all need to take to heart a line spoken by the character Hyman Roth in the The Godfather Part II who said, "This is the business we have chosen." Thank goodness at least two council members, Vice Mayor Pat Hume and Steve Detrick, have determined they can fulfill their elected duties sans assistant. That saves a little cash. Then there are piles of architectural drawings, feasibility studies, and lawsuits that are piling up and collecting dust at city hall. The City Council hasn't met a shady consultant or feasibility study for some wobbly construction project they can't live without. It is like the City of Elk Grove is a mark for every snake oil salesmen this side of Mississippi. Then there are the shell games the city is playing with taxpayers dollars. They borrowed $6 million from the drainage fund to purchase an overpriced 99-acre parcel outside of city limits for a soccer project that lacks any coherent financing that is already at a competitive disadvantage to a similar project in Roseville. And while we are at it, the city council looks to rub a little more salt into taxpayers wounds. One of the schemes the city council said they would be willing to explore is increasing sales taxes to fund their pet projects. Not only are sales taxes regressive hurting the most vulnerable taxpayers in Elk Grove, this is an indicator of how our city's cash reserves have been gutted with nothing to show except the aforementioned dust collectors residing on some shelve or computer at city hall. 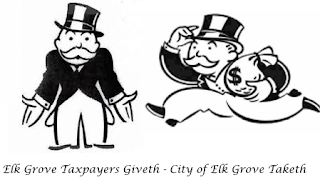 So as I review my property tax bill, it is my opinion that the Elk Grove City Council are poor stewards of taxpayers' money. In my view, the time has come for one or more of the council members to take a stand, kill some of the Mayor Davis' dangerous plans and become the adults in the room. So am I getting my money's worth from the City of Elk Grove, under current conditions I Think Not! The empty City Council Chambers allow all those things you refer to in your article to happen. Also, most people probably could not tell you how much they pay in taxes and assessments because those amounts fly under the radar in an impound account along with their monthly mortgage payment. But just as our groundwater is being depleted, the well for taxes is only so deep, and once the city hits the serious money, there will be hell to pay at the polling booths. Let's not forget that most residents pay assessments that can be raised annually for inflation-so if inflation also raises its ugly head, no political consultant in Sacramento will be able to save these tax and spend "leaders". Not getting my money's worth. Well, that was the most depressing day this year. No, I'm not getting my monies worth...we're stuck in a deep hole and not one of our city leaders seem to know how to pull us out...just sinking deeper each day. You would think that with all those highly paid city employees and part-time electeds, that luck or the odds would be with us and three would have their head screwed on straight. With regards to the CCSD and the EGUSD, for the most part I am getting my money's worth. Our parks are well maintained, and with the exception of their headquarters catching fire, the fire department seems to suppress fires and provide good emergency medical services. The school district does a good, but not a great job educating our youth. There seems to be too much emphasis on sports and minimal attention given to the arts. I'll be interested to see if they sponsor/support more construction bonds at the behest of developers next year. As for the city, they are wasting taxpayers’ money every opportunity that they can. Be it the eTran buses from years ago or their endless feasibility studies, they are doing a p@ss poor job. They have a long an inglorious track record that is beginning to catch up with them. So to answer your question; no I don't believe my family is getting our money's worth with the City of Elk Grove. Not enough focus on academics. Elk Grove is the home of suburban mediocrity. I trust our leaders are taking us on a course of success. They need our tax money as a stimulus for economic incentives. It takes money to make money. We are fortunate to have a jock as our Mayor who is pushing for soccer and swimming. After all, Kevin Johnson only has basketball credentials. I'm sure Mayor Davis has a long history of athletics under his belt, probably more than Kevin Johnson. His sports background and our taxes will put Elk Grove on the map as the sports mecca of Northern California! A bit off topic, but did anyone notice that Sacramento, Folsom and Lodi are included in next year's Amgen's Bike Tour of California? So much for making Elk Grove an athletic much less a tourist destination! Six of us professional ladies got together for our monthly lunch Thursday at one of our little restaurants here in EG and had a discussion about this. We all agreed that in the last 5-8 years since moving here that nothing has changed. We still go to Sacto, Roseville or Folsom for theatre and arts - family dinners - shopping for clothes & furniture - etc. We do attend some of the local school events, but the city has nothing to do with those. The Strauss Festival is great, but the city fails at the Chili Festival. Wilton has that one down ten times over. We then discussed how our city looks when driving down our streets. Now that drew laughs. We wondered how the city & commercial landowners determine whos responsibility it is to keep the 2+ feet cleared between their property & the cities right of way. That no-mans land area. You know...the brush, tall weeds & trash that we see along our roadways. Especially bad along EG Blvd. & on Bruceville. Appears they're still working on that one. lol As for Old Town...we have the Arts, A Deli & couple of good restaurants & Food Trucks (whoopee). Now the area of West EG Blvd. closer to I-5. Nice looking, clean, few good eating places, beautiful Beauty Salon. A place that would be good to build on for more of our needs.